The Rail Safety Improvement Act of 2008 mandates that passenger railroads and many freight railroads have a functional Positive Train Control (PTC) system installed by the end of 2015. The total cost for Metra to fully implement PTC is $400 million, of which $275 million still needs to be raised. Metra hopes that it will receive grants for the remaining amount not covered by fare increases. This amount includes the full cost of installing PTC on the five Metra-owned lines and shared costs with the freight railroads on the other six. Work that still needs to be done includes upgrading signal equipment and the dispatch center, installation of wayside devices, and adding necessary equipment to locomotives and cab cars. The new Highliners are already PTC-equipped. At this time, it is clear that the Dec. 31 deadline will not be met. The FRA has threatened to fine railroads up to $25,000 per day for operating past this date without a fully functional PTC system. For this reason, Metra has stated that it will shut down in 2016 unless the deadline is extended. My personal view is that the threat of a shutdown is just a way to force Congress to extend the deadline. This action affects the freight railroads too, and I highly doubt that they would let many of the country's major rail routes come to a halt. In other words, no need to be worried about a shutdown yet. As unpredictable as this Congress is, "anything can happen and probably will. "* It doesn't have much time to get off the schneid. *Frequent expression by Sam Menacker in WWA Wrestling on Channel 26. The Positive Train Control Enforcement and Implementation Act of 2015, introduced to Congress today, would extend the PTC deadline to the end of 2018. Metra's previous estimate was to have its PTC system complete by 2019, so they will be cutting it close to say the least. Interestingly, this article says "The Federal Railroad Administration... [has] previously recommended extending the Positive Train Control deadline". That is contrary to their stated position that the railroads agreed in 2010 that they could meet the 2015 deadline, and so should not be given a reprieve. Moving Forward had an item about the PTC legislation--like why?--until the line "Pace officials have met with counterparts from CTA and Metra to plan bus operations to shuttle commuters in the event of a rail system shutdown"--like that would really work. I was in the process of typing this but you beat me to it. If they had any kind of bus shuttle, it would have to serve only a select few of the busiest stops. For example, a Naperville-Chicago rush hour express. Heck, Pace and CTA might need all their spare buses for just that one route, and those buses would be packed to say the least. If there's any upside to this, we know Metra is telling the truth when they say they are working with their "transit partners". Even something like that (a BNSF train serving stations in a particular zone) is approx. 10 cars, or maybe like 1200 passenger max capacity in one train. Makes the Yellow Line shuttle look like chicken feed. 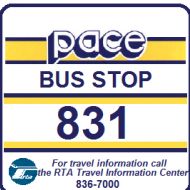 Then would have to get the buses on I-88 and I-290. I was just thinking that , should there be a Metra shutdown, many Naperville and Joliet area passengers will try to drive to Plainfield/Naperville to get on 755/850/851/855. Even if they could get more buses on those routes, there would be serious parking capacity issues there. Better to have a plan than to not, even if the alternative may be less desirable (or not feasible). I wouldn't fully dismiss it. Good news: Congress has approved H.R.3819 which includes an extension of the PTC deadline to the end of 2018. It will likely be signed into law by Obama, so no need to worry about a Metra shutdown next year. Not noted there, but noted in such sources as this is that the Senate also passed the bill, so you are correct that it is going to the President. Update: Tribune version and Metra reaction. Related is a Nova on Why Trains Crash (last Monday on 11.2, this Monday on 20.1). Metra got featured twice, once footage of someone crossing in front of a train at MP 11.5 and another skyline shot of a train pulling out on the BNSF. Anyway, this started as the usual one about why the railroads don't have PTC when Congress mandated it by 2015, but they eventually got to an answer that Metrolink did install it after the Chatsworth collision, but the problem is all the other freight trains in its territory. After ruminating over grade crossing accidents and the like, they said that the only really safe high speed rail was in Japan, where it is on a dedicated elevated track, and maintenance standards are extremely high. I guess that indicates that while there is talk about high speed rail in the U.S., it isn't the real thing. They also said that Japan has laser detectors at crossings to detect is something is stuck between the gates and stop the train in time. I wonder, though, it it could have detected Phil Pagano walking around the gates in time. Daily Herald had a reference to the Metra site that positive train control will affect schedules on the BNSF. Explanation given in the video is that it will take more time to flip a train due to the time needed to enter information into the console. Metra has completed its PTC installation. They have been running test trains this week. Tuesday, on the Rock Island, I saw a CSX geometry train followed by a two-car Metra. Today (Sunday) on the SWS I saw a five-car train with a locomotive on each end. EDIT: Sunday's sighting was not for PTC testing, but for a collision demonstration. Metra is working on a revised schedule for the Rock Island for accommodating PTC and it is open for comments/feedback on Metra’s website. Train #323, scheduled to arrive Waukegan at 12:54 PM, is operating 15 to 20 minutes behind schedule due to Positive Train Control issue. Please listen to platform announcements for the location of this train. So PTC is now used on the UP North & screwing its schedules up, just like on the Burlington. I have an additional PTC question. Now that it's in use, does the FRA speed limit of 79 MPH still apply? I believe so, as the speed limits are determined by the condition of the track. IIRC, tracks are assigned classes, based on the conditions they're in, which then determines speed limits. Most of UP track in Chicago is rated at Class IV (60 for freight, 80 for passenger). Class V is 80 freight, 90 passenger and Class VI is 110 for both. So far, that's the only Metra Alert email I've gotten saying PTC was the problem on the UPN, but there have have a huge number of mechanical failures this week, or is Metra lying & claiming PTC problems are mechanical ones? I just don't trust them to tell the truth lately! What I really hate about the Alert emails that claim construction is the cause of the delays, is where is the construction zone? I'm always getting them for SB trains, prior to them getting to any of the stops I use, such as Rogers Park, Wilmette & Hubbard Woods. Other than the construction at the Deering Bridge & the Ravenswood inbound platform, I know it's got to be north of Hubbard Woods, because I rarely go north of there. I think going forward the mechanical problem will be used more. Once I left the station and HEP dies and train stop. The fix the issue and go on. Then the other day we are pulling up to lake bluff and lights cut off for a second. There were mechanical issues last week on the UP-W while I was at Wheaton. The inbound train was 42 minutes late. You have to remember that Metra's equipment is OLD. Old locomotives and old gallery cars are still running. The UP cant run the newer heavier locomotives. What does any of this have to do with PTC? Train #336, scheduled to arrive Ogilvie Transportation Center at 11:28 AM, is operating 15 to 20 minutes behind schedule due to positive train control issues. Please listen to platform announcements for the location of this train.